Three merchants by the names of Laurence, Watkins, and Ellerbee, were traveling to the city of Lyme by way of the high road. However, when stopping at a local inn, they were informed that a hostile army had camped on the road ahead. Dismayed by this information they inquired if any other route was to be taken on the way to Lyme. 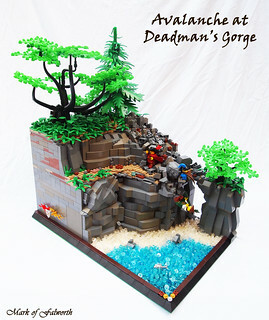 After hearing several different and ridiculous options, and consulting their map, they decided to take the trail through Deadman's Gorge... They later regretted their Ill-Advised Journey. This is my first entry to the "An Ill Advised Journey" Category. This build is inspired by many great builders around the community. It's been a great first year guys! Thanks so much! Very cool, awesome idea for this category and great adaption. I really like that tree with many black branches. Is it dino tails the parts or? Very good build!I like the sideways rock-work.You seem to have a knack for it. Wow, sweet dude! I love all of the sideways rockwork, and the crumbly rock bits. Oh, and that tree is amazing too! Your rockwork is excellent, and even with all the bley, there is still a lot of color here. Love the water technique. Oh, and that tree is fantastic. A great use for those dinosaur tails/tentacle bits! Great color mottling, buddy. Good luck! Really nice Mark! Somehow I missed this one on Flickr, but I love all the angles, colors, and great action! Lovely scene Mark! Great tree. Love the rockwork on this. The avalanche came out really well and I think you really get the sense that the bricks really are in motion and you just happened to catch a picture of the action. Great fig posing as well. Good luck in the contest!